The amino acid complexer E9 is a powerful energy support able to replenish your system with essential amino acids, vitamins and minerals needed. As mixed with water, this tasty drink will give you a good healthy boost each day. This solution was designed to help people cope with their busy life which demands for intense daily activities and high energy levels. So, boosting energy becomes the increasingly important in the modern life pace. Most of energy drinks on the shop shelves offer little or no nutritional value. In fact, some of them are unhealthy. They simply load the body with unnecessary amounts of sugar and artificial caffeine which often causes the ‘sudden crash’. E9 is a unique blend of amino acids (including L-arginine), and extracts from guarana and green tea leaves plus a combination of vitamins. Taking E9 daily, you will get a high energy boost without experiencing any crash. 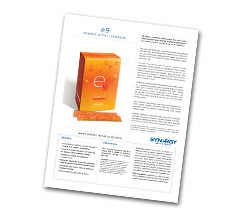 Thanks to its low calorie formulation, E9 provides steady high energy supply for hours. ✽ Boosting energy levels with high energy supply for hours. ✽ Improving blood circulation while reducing blood pressure. ✽ Strengthening the immune system. ✽ Supplying necessary amino acids, B-vitamins, and herbal extracts to give your body the healthy boost. E9 will provide you and your family members and friends with the healthy energy resource with no side effects. Inulin, amino acid blend (L-arginine, L-taurine, L-lysine, L-glutamine,L-glycine, L-tyrosine, L-leucine, L-isoleucine, l-valine), guarana seed extract (Paullinia cupana), white willow bark (Salix alba), yerba mate leaf extract (Ilex paraguariensis), green tea leaf extract (Camellia sinensis), Korean ginseng root extract (Panax ginseng), maca root extract (Lipidium meyenni), acai berry concentrate (Euterpe oleracea), aloe vera whole leaf concentrate (Aloe barbadensis).